Absente, the modern day Absenthe! So we had some flounder fillets on hand and wanted to come up with a way to prepare them that was a little different, but not too unusual. After lurking around the pantry and fridge, finding some spinach, and decided to build on those two ingredients as the base for this dish. 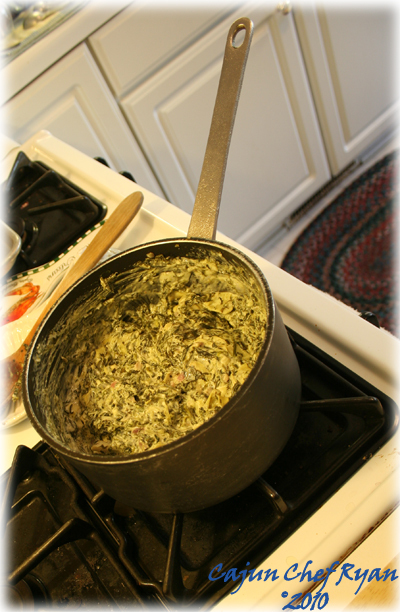 The stuffing grew in a creation of spinach, artichoke, Absinthe, garlic, onion, Gorgonzola, cream cheese, and parmesan cheese. An amazing texture and flavor with a reminiscence of a Rockefeller stuffing found on many a baked oyster on New Orleans menus, but this one with a creamy texture and artichoke hearts. Once in the kitchen, the recipe came together as decisions on how to “stuff” the flounder, and the combination of ingredients in the stuffing evolved from a simple flounder rolls with steamed spinach recipe from the days of yore to a full-blown vegetable and cheese potpourri. As the spinach and artichokes were heating up in the pan, thoughts of flashing them with some form of white wine passed through the synapses. Further inspection of the cupboard and it was bare of any light wines, and then upon opening the bar thoughts of Rockefeller flashed in the brain, and then opted for the Absinthe, or Absente as it is now known, with its telltale sign of anise like licorice flavor, and high alcohol content, a diminutive portion, anise hints at most. As the stuffing came together wanted to add some breading to help hold it together, but none were found, so no form of flour or bread was added, which turned out to be a good thing, this stuffing is very moist and held together well once roasted with the flounder. The flounder fillets were thin and delicate, so any cutting of slits or pockets were out of the question. How would we stuff these elusive white fleshed fish fillets? Roll them over boys, just roll them over! Tails over the heads, or head over tails…something like that! A sauce, the dish needs a sauce! Roma tomatoes in the front garden, picked sixteen of the red morsels, and created a Basil Tomato Concasee with fresh sweet basil in the patch. This turned out to be more of a stewed tomato than a sauce, but it was still great. The moist dressing made up for any lack of a sauce, so really, no sauce required. 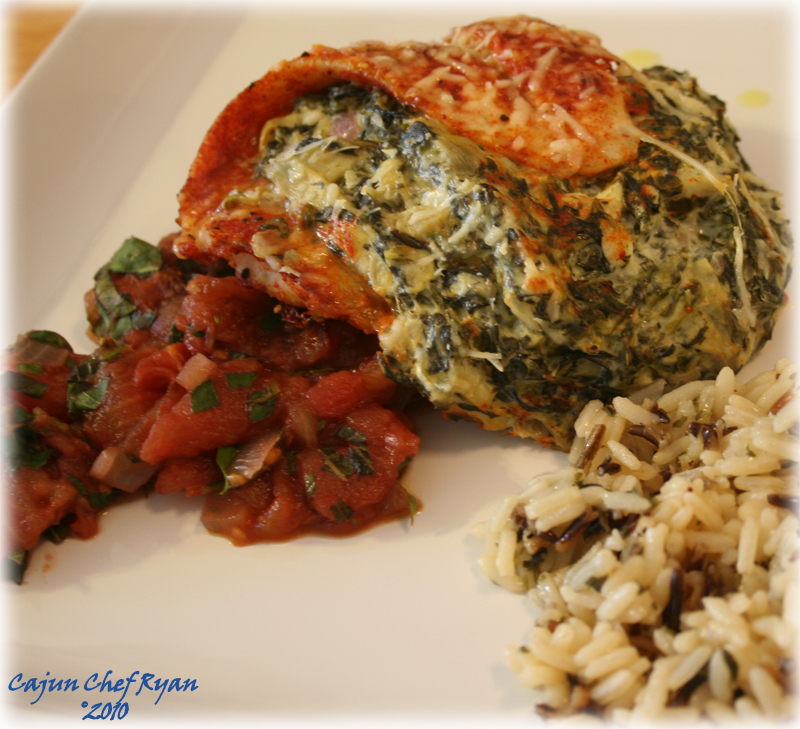 I also made a small batch of wild rice to accompany the dish, when plating I put a small portion of the Basil Tomato Concasee as a base, then added a portion of the stuffed flounder, then added some of the wild rice, and tiny bit of olive oil drizzle on the plate for garnish. “Where did you find this recipe?” assumed my dear wife “Is this from Julia Child?” Nope, I made it up myself! Therefore, here is the recipe for Stuffed Flounder that I developed on the fly, creating from a pallet of available ingredients and painting a dish that the family loved. Even the boys ate this up! Procedure Steps Note: Pre-heat oven to 425° F.
1. Add olive oil to a saucepan over medium heat, add the onions and sauté several minutes until soft and translucent, and then add the garlic and sauté until soft. Fold in the spinach and artichokes and heat through. Add the absinthe, stir well and allow to heat through. 2. 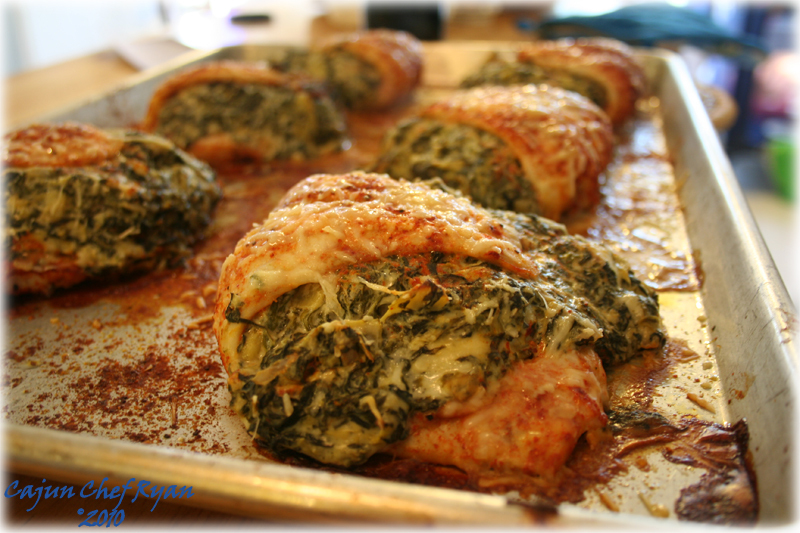 Fold in the tempered cream cheese and fold in well, then add the Gorgonzola and ½ cup of the parmesan cheese and fold in gently. Season to taste with the salt and white pepper. 3. Allow the stuffing to cool for 15 to 20 minutes before stuffing the flounder. 4. Lightly season both sides of the flounder with the Finger Lickin Rub or any seasoned rub mixture, or paprika. Coat a sheet pan with olive oil or cooking spray, and with the rounded side of the fillet down on the sheet pan spoon about ¾ cup of the stuffing onto the head end of the filet, then wrap the tail around the filet. Once all the flounder fillets have been stuffed, evenly sprinkle the remaining ¼ of parmesan cheese. 5. Place the pan in the oven and roast for about 20 – 25 minutes, or until the fillets are opaque or white, the cheese is melted, the stuffing is heated through, and the tops are browned slightly. 1. Score the tomatoes with an X at the bottom, and blanch them in boiling water for several minutes to loosen the skin. Drain them and allow to cool until you are able to handle them. Then peel and discard the skin. Cut the tomatoes in half along the equator, not lengthwise. Then run the open ends of the tomatoes under a stream of cool water to dislodge and remove the seeds. 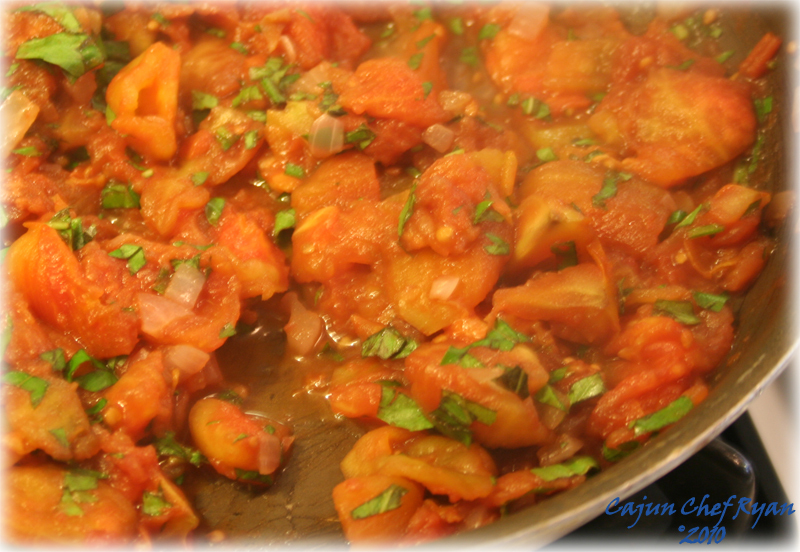 Cut the tomatoes into large chunks. 2. Heat the olive oil in a large sauté pan and add the onions, sauté until translucent. 3. Add the concasee tomatoes to the pan and stir well, allow the liquid to cook down, and then add the cabernet and stir well, and continue to simmer until au sec, or almost dry. 4. Turn off the heat and fold in the basil, then season to taste with the salt and white pepper. 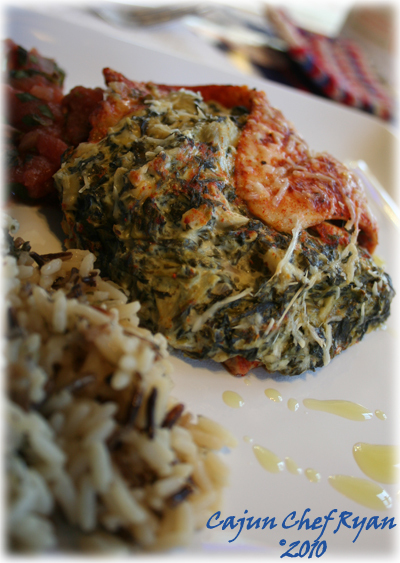 Wow – this is so stuffed with flavor!! I wish flounder was easier to get where I live. I may have to substitute a different species of fish but I like the stuffing great post! How creative. Your Stuffed Flounder looks amazing. Love the stewed tomatoes. Oh, God! This is the most beautiful fish I’ve ever seen! My grandmother used to stuff flounder for us years ago back in NY. I have not had flounder in a billion years. Beautiful to look at! Thanks for sharing this. this is probably the best looking stuffed ‘anything’ i’ve ever seen. I can’t wait to try it!! You “developed it on the fly”??? I’m not worthy. Gee, flounder everywhere today lol. This looks amazing and love the Absenthe addition. What a great throw together dish! AND what a compliment from the wife! Looks delish! We don’t eat fish very often but wowza that looks good (of course anything based on a “a full-blown vegetable and cheese potpourri” is a winner in my book!) 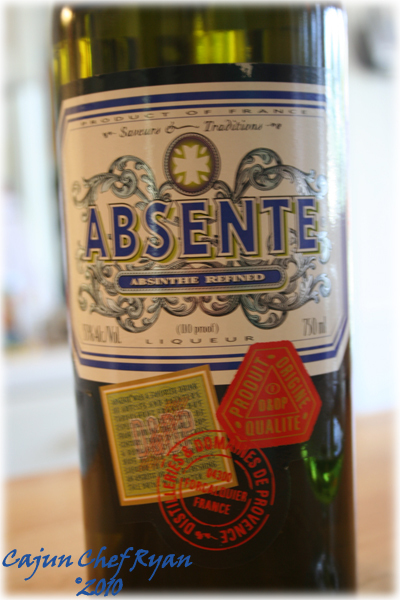 Love the absinthe label…I’m a sucker for a pretty label. Beautiful dish all around! a real keeper here and book marking will be making this within my weeks menu;s for sure love this…especially cabernet and cheese omg fabulous! Wow CCR!! that looks amazing. I love all the flavors going on in the stuffing. Great pictures! Thank you all so much for the wonderful comments! Sometimes necessity is the mother of invention!